NB: Angela Mount bases her wine scores on quality of wine linked to value for money. 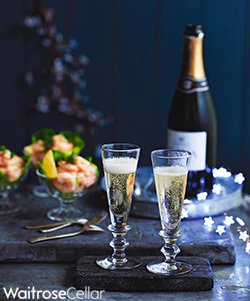 Waitrose consistently deliver across the board in terms of the quality of their wines, but they get extra thumbs up for their brilliant Champagne range, which scoops armfuls of medals across all wine awards every year. This one is my favourite this season; made entirely from the Chardonnay grape, it tempts with its fine mousse, and stream of tiny bubbles, and is a true ‘A’ lister, with its poise, elegance and sheer sophistication. Pale golden in colour, it’s full of rich, creamy, baked apple and baked brioche aromas, with hints of toasted hazelnuts. Taste it, and it’s simply perfect – smooth, creamy, rich and toasty, yet with a delightful freshness and citrus edge, which adds even more to its charm. This is simply incredible value for money – top notch vintage champagne, beautifully aged, from one of the largest and most respected producers in the region. Another Champagne made purely from the Chardonnay grape, rich, toasty, and complex, it’s a very worthy but great value celebratory bottle. Golden in hue, with a delicate fizz, it is sophisticated and elegant, with layers of rich, creamy flavours, aromas of buttered toast, pears, warm bread tinged with a hint of honey. Glorious. I normally hate celebrity wines; but I have to admit that this one is rather good; in fact it’s extremely good, and it’s just won a silver medal in a blind tasting at the International Wine Challenge, pitched up against the very best of New Zealand Sauvignons – and they don’t give silver medals easily! It also happens to be made by 2 of the smartest New Zealand guys I know, Rob Cameron and Tim Lightbourne, from one of the fastest growing wine companies in the country, Invivo. They are passionate about what they do, they make fabulous wine, and they know how to communicate their story. This is a fabulous blend that they put together with Graham, and hats off to them – ripe, bold, punchy, and jam-packed with passion fruit and lime character, and with a delightfully zesty finish, this is textbook stuff, and well worth a try – especially with goats cheese, goan fish curry, or chilli spiced calamari. South African wines are riding the crest of a wave right now, as the pioneering spirit of passionate, enthusiastic winemakers yields more and more wines from the Cape, which are breathtakingly stylish and top quality, at all levels of the pricing scale. I’ve picked this one, as I love Chenin as a food wine, especially in the winter months. This one is made way north of Cape Town, through rugged, red earth mountains, from the highest vineyards in the Cape – spectacular in their setting, they also benefit from the high altitude, in terms of the positive effects that the cooler air, and also ocean breezes have on the wines, keeping them fresh, crisp, and lively. Chenin Blanc is a fascinating and delicious grape variety – full of rich, opulent, apricot and peach-stashed character, yet with a lively freshness. This is a great example, stylish, crisp, yet oozing rich fruit flavours, with a dusting of spice, and a natural warmth – one of my favourite whites for this time of year, perfect with pork, gammon, fruity tagines and spicy seafood dishes. The campaign to re-instill faith in the glorious qualities of the Riesling grape continues, and this is a fabulous example. An outstanding German Riesling, with all the hallmarks of classic style, without the price tag. The Rheingau is arguably the most prestigious wine region in Germany, with vines perched on the steep hills, overlooking the Rhine. This Riesling is a true gem – bright, fresh and lovely, with a refreshingly light 11% alcohol. With scents of candied lemon and honeysuckle, it has a delicious, zesty, lemon and honey character, with extraordinary zestiness – sweet, sour, tangy, vibrant, and above all, a gorgeous glass of freshness; the perfect match to Thai and Indian dishes, smoked fish, or just delicious on its own. 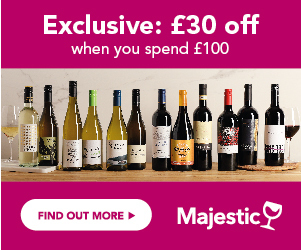 This is part of the new ‘own brand’ range that Majestic launched in September, entitled ‘Definition’ – a small selection of classic wines from all corners of the world, which aim to define the style of the grape or the region. This one is a clever buy. A claret with some decent age, from a ‘satellite’ region, close to the revered area of Saint Emilion, Montagne Saint-Emilion, where the wines are very similar, and generally far better value. This soft, rich, velvety red is made from 80% plummy, juicy Merlot, with a 20% dollop of fragrant, raspberry-stashed Cabernet Franc. This is tremendous value for a quality claret, with a decent bit of maturity. Spot on with rib of beef, slow-roast lamb, or a slab of quality cheddar. For lovers of northern Rhone style Syrah, at a bargain price, this is a fantastic winter wine. From the steep banks of the hills over the glittering Rhone River, it’s a lovely, rich, spiced-up red, dense and brooding, and packed with sophisticated, black cherry and bramble fruit, laced with licorice, warm spice, and wild herbs. It’s dark, full-bodied, yet with lovely balance, perfect with rich stews, venison sausages, and slow-roast lamb shanks. This is a great Christmas claret from Asda, with style and presence; it has warmth, charm, and a delightfully soft touch, stashed with plump plum and blackcurrant fruit, oozing generosity. The predominance of the Merlot grape adds to the richness and softness of this charming red. Very fruity, extremely approachable, with none of the harsh edges often associated with inexpensive Bordeaux, it’s ripe and mellow, with dark fruit and cedar on the nose. It punches well above its weight with its rich, sweet damson and mocha flavours – fruity and bright. Great with rosy-pink roast lamb and beef stew. Asti has unfortunately, and wrongly, received a lot of bad press in recent years; but, well made, it’s a gorgeous, lively, fruit-packed, low alcohol sparkler, with real character and freshness. Bright, bubbly, and gently sweet, it’s utterly delicious, fragrant and smells and tastes of freshly crushed table grapes and elderflowers. Made from the Moscato grape, in north west Italy, and, in this case, from one of the top producers in the area, this is a frothy, delightful, refreshing glass of fizz, with a lively citrus tang, simply perfect with fruit-based desserts. This is a sublime dessert wine, which will provide the sweet, indulgent, yet refreshing treat, at the end of the festive feast. If you don’t think you like sweet wine, please think again… from one of South Africa’s top estates, it’s a golden-hued delight, wafting aromas of acacia honey, candied orange peel, caramel, and citrus zest. Many people think sweet wines will be cloying and overpowering; this one rises with lemony zest and a refreshing zing – elegant, stylish, and full of charm, it’s a gorgeous sweetie, with a crisp and sassy edge – perfect with mince pies, or with any citrus or fruit-based dessert. *This article is showing the prices and stock available on 18/12/2015.